Launched at the Detroit Auto Show 2011 as the concept, Honda Civic Si Concept Coupe, the car is now making to production. 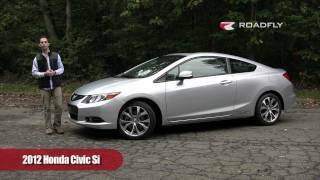 The Honda Civic Si Coupe 2012 features the new 2.4 liter engine that produces 201 HP @ 7000 rpm and 170 lb-ft. of torque @ 4300 rpm. Even with more power and torque, the fuel economy for the 2012 MY has improved slightly ( 2 mpg on highway and 1 mpg in the city). The all-new 2012 Civic Si Coupe and Civic Si Sedan prioritize the performance potential of the Civic platform with a 201–horsepower i-VTEC® 4-cylinder engine, a sport-tuned suspension and exclusive features for the enthusiast driver. "The Civic Si represents the sporty flagship of the Civic series," said John Mendel, executive vice president of American Honda Motor Co., Inc. "The broadened torque band of the 2012 model increases its appeal as a daily driver while adding a new dimension of mid-range performance." More powerful than the 2.0-liter engine in the previous generation Civic Si, the new 2.4-liter engine produces 201 horsepower @ 7000 rpm and 170 lb-ft. torque @ 4300 rpm, an improvement of 4 horsepower and 31 lb-ft. of torque compared to the previous model. A sport-oriented six-speed manual transmission sends power to a helical-type limited-slip differential (LSD). The LSD helps the Civic Si accelerate powerfully and confidently when exiting corners as both wheels can deliver more equal torque distribution to the road compared to a conventional open-type differential. Exclusive Civic Si exterior features include 17-inch alloy wheels with 215/45R17 tires (summer tires available on the coupe), a body-color deck lid spoiler with an LED center brake light, fog lights and a chrome exhaust finisher. Inside is an exclusive aluminum shift knob with leather, textured aluminum pedals and firmly bolstered perforated cloth sport seats with suede-like trim and red stitching. The steering wheel is leather-trimmed with red stitching. The new "intelligent" Multi-Information Display (i-MID) on the Civic Si includes an exclusive Power Monitor (as one of its screens) that can indicate the percentage of total horsepower generated by the engine. In addition, a Sequential Rev-limit Indicator located on the upper instrument panel can show when the i-VTEC high-lift camshaft profile is engaged and incrementally when the engine redline is approached and reached. The Civic Si engine is designed to provide spirited acceleration with low exhaust emissions and good fuel economy for a compact vehicle. The 2.4-liter inline 4-cylinder engine is constructed of lightweight aluminum and features a valvetrain system that incorporates dual overhead camshafts (DOHC) and four valves per cylinder (16 valves total). A performance version of Honda’s i-VTEC system pairs Variable Valve Timing and Lift Electronic Control (VTEC®) with Variable Timing Control™ (VTC™). 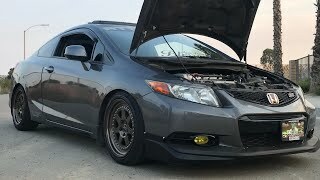 The Civic Si i-VTEC system allows for the production of both low-rpm torque and high-rpm horsepower, which can be a distinct benefit compared to conventional engine designs with fixed valve timing. A high-volume intake manifold and a high-flow, low-backpressure exhaust system elevates the sporty demeanor and aggressive sound of the Civic Si. Dual balance shafts provide exceptional smoothness for a 4-cylinder engine. Compared to the previous generation, the 20-percent-larger engine displacement contributes to peak power production at 7000 rpm instead of the previous engine’s 7800 rpm peak. The increased displacement also contributes to a substantial 22-percent increase in peak torque, now occurring at 4400 rpm, a substantial 1700 rpm lower than the previous engine’s 6100 rpm. The result is stronger and more immediate acceleration in a typical city driving environment. The EPA-estimated city/highway/combined fuel economy rating1 of 22/31/25 miles per gallon is 1 mpg higher in the city and 2 mpg higher on the highway compared to the 2011 model. The Civic Si engine also meets stringent Ultra Low Emission Vehicle (ULEV-2) tailpipe emissions standards. In keeping with the performance enthusiast mission of the vehicle, a 6-speed manual with a short-throw shifter is the only transmission available. Compact and lightweight, the transmission provides firm and direct shift action. The Civic Si also has a lightweight, high-capacity clutch utilizing a pedal assembly optimized for both low-effort actuation and a broad, smooth engagement band. Designed with a sleek windshield rake, a sweeping roofline and a new interpretation of the previous model’s "one-motion" profile, the lines of the 2012 Civic Sedan suggest a sophisticated and athletic appearance. The Civic Coupe with its shorter length and unique front and rear styling result in a more aggressive and dramatic styling demeanor. Both vehicles feature a low and wide stance that contributes to a distinctive visual presence, while thinner A-pillars stretch further toward the front of the vehicle than before to improve visibility and the perception of interior space. The C-pillars also stretch further toward the rear of the vehicle compared to the previous generation to better complete the flowing one-motion appearance. Adding to the extensive 2012 Civic color palette, the Civic Si Coupe and Civic Si Sedan models add the availability of a new Sunburst Orange Pearl paint color that change in appearance depending on sunlight conditions, further amplifying the dramatic bodylines. 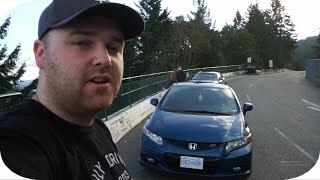 The 2012 Civic embraces Honda’s tradition of making its vehicles fun to drive by continuing to use a fully independent suspension design, a premium and exceptional feature in the entry compact segment. The front MacPherson strut and rear multi-link suspensions are tuned for sporty driving fun, yet provide refined ride comfort. Ride and handling improvements are made possible by a 10-percent more rigid unit-body structure resulting from enhanced structural designs and increased use of high-strength steel (55 percent on the sedan compared to 50 percent on the previous model). The Civic Si receives exclusive suspension tuning compared to the Civic Sedan and Coupe. Front and rear spring rates are increased, sport-tuned damper settings are used front and rear, and Civic Si models have a 0.4-inch lower ride height. Front and rear stabilizer bars are larger, measuring 18 mm in the front and 15 mm in the rear. 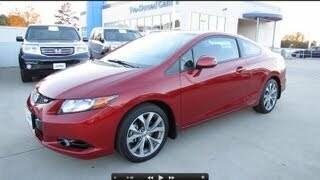 The Civic Si Coupe and Civic Si Sedan have a 17.7:1 steering ratio, identical to the other 2012 Civic models. The Civic Si has 4-wheel disc brakes with11.8-inch vented front rotors (up from 10.3 inches on all other Civic models) and 10.2-inch solid rear rotors. For safety, a wide variety of standard equipment includes Honda’s exclusive Advanced Compatibility Engineering™ (ACE™) body structure for enhanced frontal collision energy management and vehicle-to-vehicle crash compatibility. ACE enhances frontal collision energy management through a network of load bearing structures in the front of the vehicle. Standard safety equipment includes VSA that integrates with the new Motion Adaptive EPS system; dual-stage, multiple-threshold front airbags; front side airbags with occupant position detection system (OPDS); side curtain airbags; and a 4-channel anti-lock braking system (ABS) with Electronic Brake Distribution (EBD) and Brake Assist. Exclusive driver-oriented Civic Si Coupe and Civic Si Sedan interior features include firmly bolstered front sport seats and a special Civic Si interior color scheme with red ambient interior lighting. The front seats increase lateral support with firmer side bolsters compared to the other models. As with other Civic models, both of the Civic Si front seats manually recline, and the driver’s seat features a manual height adjustment control. Both Civic Si models likewise offer versatile 60/40 split fold-down rear seatbacks, which allow multiple configurations for passenger seating and cargo storage. A rear-seat center armrest with two beverage holders is included on the Civic Si. The two-tier instrument panel in the Civic Si exclusively has red-backlit instrumentation. The new Sequential Rev-limit Indicator is located to the left of the speedometer display close to the driver’s line of sight, and also includes an i-VTEC indicator. The i-VTEC indicator illuminates when the VTEC system shifts from low to high-rpm cam profiles, and the rev-limit indicator’s array of six lights illuminate sequentially as engine speed rises. The first four lights are orange, and the last two are red. The engine is producing maximum power when the second of the two red lights illuminates. The second red light indicates that the maximum rpm of the engine has been reached. An additional feature within the i-MID is the Power Monitor screen, which displays a graphic of the engine and its power output as a percentage ranging between 0 and 100 percent. An instant fuel-mileage indicator also lets drivers keep tabs on fuel economy on a real-time basis. Both Civic Si models include an AM/FM/CD Premium Audio system with 360 watts total of power and seven speakers, including a pair of front tweeters and an 8-inch subwoofer located in the rear window shelf. The system includes WMA/MP3 audio-file reading capability, on-screen CD and album information, steering-wheel mounted audio controls, speed-sensitive volume control (SVC), XM® Radio capability, an auxiliary input jack, a USB audio interface for compatible devices and Bluetooth® audio streaming. In addition, the standard Bluetooth HandsFreeLink® telephone interface is designed to work with compatible mobile phones. Mobile phone audio files can also be streamed wirelessly. The available Honda Satellite-Linked Navigation System has a 6.5-inch display and 16 GB of flash memory in place of the DVD-based system used in the previous generation. The new system allows for simple, intuitive operation and provides more than 10 million points of interest. The navigation system can now overlay FM Traffic data on its maps, a free public resource available in participating major metropolitan areas for traffic congestion, incidents and construction zones. The voice activation is capable of recognizing numbers, street names and city names, and it can control the audio system. More than 95 percent of the Civics sold in the United States are currently produced and assembled2 in the United States and Canada. The Civic Si Coupe and Civic Si Sedan models are produced and assembled at the Honda of Canada Manufacturing plant in Alliston, Ontario. All 2012 Civics are covered by a 3-year/36,000-mile new car limited warranty, a 5-year/60,000-mile powertrain limited warranty, and a 5-year/unlimited-mile corrosion limited warranty. 1Preliminary EPA mileage estimates determined by Honda. Final EPA mileage estimates not available at the time of printing. Use for comparison purposes only. Your actual mileage will vary depending on how you drive and maintain your vehicle.